Sweet, crunchy, buttery... These waffle "cookies" are a traditional treat in Belgium, where street vendors cook and serve them to delighted aficionados. 56 mins. to 1 hrs 25 mins. 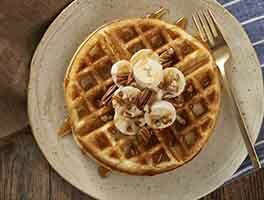 25 to 30 sugar waffles. Preheat a greased waffle iron. In a medium-sized mixing bowl, beat together the butter, eggs, sugar and vanilla/flavoring until light and fluffy. In a separate bowl, whisk together the flour, malted milk powder, baking powder and salt. Add the dry ingredients to the wet ingredients, beating until well-combined. Stir in the coarse sugar crystals. 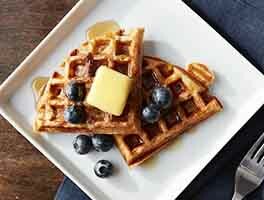 Pour a scant half-cup of batter onto the preheated waffle iron. Bake the waffle until it's a deep golden brown; this takes about 8 to 12 minutes, depending on just how brown you like them. Don't underbake; they won't be crisp when they cool. 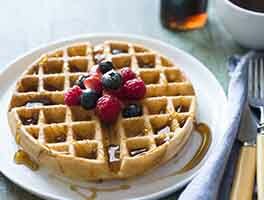 Open the waffle iron, and use a flat spatula or a couple of forks to transfer the waffle — which will be quite tender — to a wire rack to cool. The waffles will be very delicate until they cool, so expect a few to tear. When the waffles are cool enough to handle, use a pair of scissors to cut them into pieces. Allow the waffles to cool completely, for maximum crispness. Store, well-wrapped, for two weeks at room temperature. A heart-pattern iron makes attractive cookies, but any kind of "regular" (not Belgian) waffle iron will do. If you're very coordinated, you can pick up the waffle iron and flip the waffle out onto a rack. My oh my... Delicious. Amazing. Don't know what kind of waffle irons people use but I only got 9 waffles, and had to spoon it on the waffle iron, no pouring this, and needed more than 1/2 of cup of batter. Bottom center of all waffles started burning, had heat on high, maybe have to lower heat and take out at light brown, otherwise they taste good, I also used gluten free flour, could have been that. 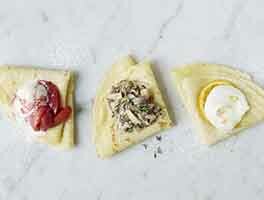 Love this recipe---I have made these for years for special occasions. They are rich and sweet and more dessert (waffle cookies) than breakfast. 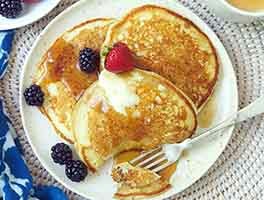 They are perfect for Christmas morning--a big treat kids can eat while opening presents, no syrup needed. I thought these were wonderful, made them twice so far. The second time, I cut them into small rounds (approx 2 1/2 inches)and made ice cream sandwiches. Of course, we ate the scraps! I think they would also present well in small triangles along with cinnamon pita chips and some fruit to be dipped into the cider cinnamon spread. It was so easy to make and so delicious. These cookies are great with hot cocoa, coffee, or ice cream. We've made these the past 3 Valentine's Day with great success! Be sure to keep them cooking longer than you really think they should so they come out nice and crunchy. The taste is delicious, and when we give them out, folks are so surprised by the texture. Last year we dipped one edge in chocolate and decorated with pink and red sprinkles - a perfect Valentine's treat for teachers, friends and family. We also make much more than needed so there's plenty of leftovers. Do try them!!! I used a belgium waffle maker and they turned out quite well. I cooked them for about 6-7 minutes (when I smelled something burning, out they came). I also used coarse brown demerara sugar which gave it a nice brown flavor. I was surprised to not find weight measures. I try and use weight measures when ever I can as I want to be as accurate as possible since I count carbs as a diabetic. These waffles have a wonderful taste and a very pleasant crunch when cooled. They are a favorite in my house.